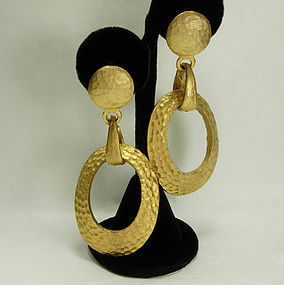 Big statement vintage 1980s long drop clip earrings in matte goldtone metal with a hammered finish, in the barbaric/Byzantine style popularized by Chanel. 3 1/8 inches long. Excellent condition. Display form is life size. Photos enlarged to show detail.